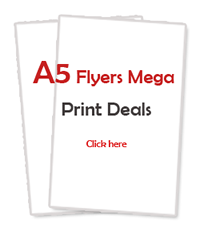 Just look at the savings you could make with our outstanding A5 flyers and leaflets. (Just choose your quantity and get in touch with us and we will take care of the rest). Don’t forget that our deals include Artwork with every order of flyers you do with us. We will not only create for you something outstanding but also we will print the flyers on very competitive prices as well. Meanwhile, we will prepare the distribution and when the leaflets are ready we will start with the drops. This is end to end full distribution system that will bring many new customers through your doors. - Leaflets can be printed on single or double sided on 150GSM gloss / matt paper. - 1 hour professional design is included in the printing price. Additional charges may apply. - No VAT is payable on the printing services. See our Terms and Conditions.